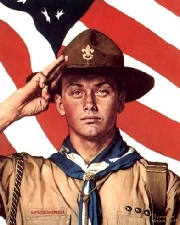 Our Scout salute and handshake are ancient signs of bravery and respect. During the colonial period of our country, many men carried weapons for protection. Sometimes when they met one another, there was an uneasy moment as each man watched the others right hand. If it went to his sword or his gun, there might be a fight. but if it went to his hat, it was a salute of friendship and respect.